Just as appearance, atmosphere, and service are important to deliver to your customers, convenience and efficiency are essential for your staff. Having the perfect commercial food carrier in your establishment can help with each and every one of these things. Commercial food carriers are a must for the professional caterer or chef that’s frequently on the go. They allow you to transport food safely and easily from one location to another, and insulated commercial food carriers even keep hot or cold foods at their correct temperature for several hours at a time! 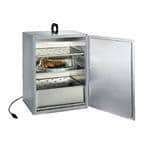 Shop CKitchen.com for all of your commercial catering and delivery needs. From durable, high capacity food pan carriers like the Eagle GroupEagle PT-1826-A Panco Pan Truck, to insulated food containers like the Carlisle XT3000R03 Cateraide Slide 'N Seal Pan Carrier — and everything in between — CKitchen offers a variety of commercial food carrier sizes and styles to help you accommodate any size food order. All of our insulated food containers are designed to keep your hot food hotter, and cold food colder, for longer periods of time to ensure your client's satisfaction. Our pan trucks and dollies are super durable with non-marking swivel plate casters for fast and easy transport. 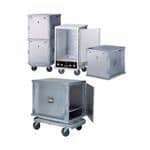 Many of our insulated commercial food carriers are stackable, and have different features including top or front loading, stain and scratch resistant, an automatic self venting system, molded in carrying handles, removable doors, and more. We carry many top of the line commercial food carrier manufacturers, including Carlisle, Eagle, Lakeside, and Piper Products/Servolift Eastern, all of which are perfect for transporting food and equipment throughout your establishment, and to other remote locations. Shop our selection of Commercial Food Carriers for the guaranteed lowest prices and fast shipping. Our top priority here at CKitchen is to provide each and every one of our customers with the very best customer service, as well as high performing, efficient, dependable products. If you need help choosing the right commercial food carrier for your needs, please give us a call and one of our certified food service equipment assistants will be happy to assist you.